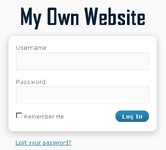 Small businesses want their own website. They also want to stay within a budget. They don’t want to be slaves to an IT company. They don’t want to have to call someone or email someone to change some content. They don’t want to hire expensive designers every time they make a change. We have found that small business owners want “My Own Website That I Can Update and Maintain Myself”, at least in the Orlando area and we are pretty sure this is just about everywhere. Our goal is to give them just that. For a realistic setup fee and a reasonable monthly service fee we create a website that they can update, maintain, change, redesign or whatever. If they need help we are there. We know that small business owners don’t want to learn how to write a website. They don’t want to learn a programming language. So we make it easy. We teach them how to use a Content Management System (CMS) that doesn’t require any of that knowledge. The instructions are in simple English and most of the functions are point and click.